Lula, Rui Barreiros Duarte, ink on paper, 2012. 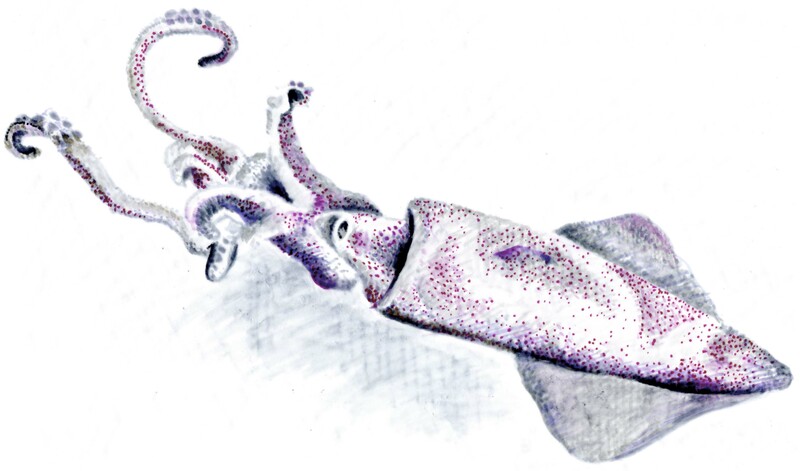 The squid is a sea socialite, always hopping from shrimp to smelt parties, elegant and glamorous in its pink-dotted design gown. This cephalopod has in recent years become a globe trotter. Every day, billions of squid travel by road, sea and air to the menus of fashionable restaurants around the world. But all this roving takes a toll on the delicate mollusk, which arrives tired and frozen, long on frequent-flyer miles and short on taste. If you’re in Portugal, don’t miss the chance to try some fresh squid. The best way to cook it is “Algarve style” (lulas à Algarvia): the squid is lightly fried in olive oil, garlic, and bay leaves. It’s a simple preparation and yet, it produces sublime results that do justice to the squid’s diaphanous freshness.